The conditions at Yorkeys Knob are near perfect for everyone. It has near perfect flat-water at the river mouth. The wind speed during the dry season is usually between 15-25 knots. The prevailing wind direction during the dry season is form the south east. During the wet season the prevailing winds are from the north. These conditions are usually very hot and can attract box jellyfish, so it pays to wear stinger protection during these months. Seabreeze.com.au is the weather website you will find most people in the area use as their go to site for weather updates. Windguru.com is another reliable website worth checking out too. When it domes to kitesurfing Yorkeys Knob, you really won’t find much better. The conditions are absolutely perfect for learning the sport. The winds are consistent and predictable. 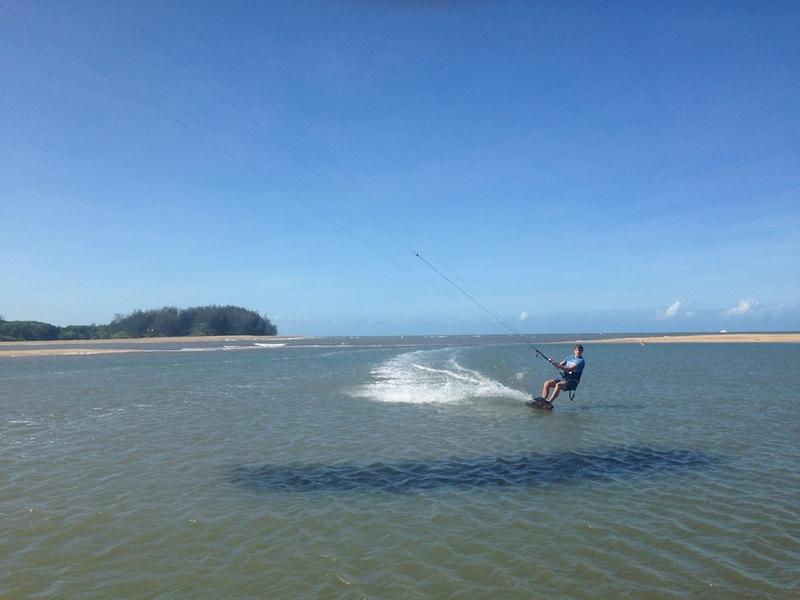 Kiteboarding Cairns and Pacific Watersports are your local kite schools in the area. These 2 schools teach at the high IKO levels an don’t try pushing you into doing big group lessons. If you are leaving from Cairns, it is very simple to get to Yorkeys Knob. Simply head north along the Captain Cook Highway and turn right when you see the sign for Yorkeys Knob. The rigging area is at the south end of Sims Esplanade on the grass. You can also catch a bus from Cairns CBD. Buses leave every half an hour. Hey everyone, this blog is all about Cairns activities. Cairns is the ultimate when it come getting outdoors and having a good time. There are so many different activities to do in the area. We guarantee you will be wanting to come back for more! In This blog we will give a bit of an insight to what there is to do in this beautiful part of the country. In Cairns we have the Great Barrier Reef as our front yard and stunning rainforest as our back yard, meaning there are endless places to explore and so many different ways of doing it. 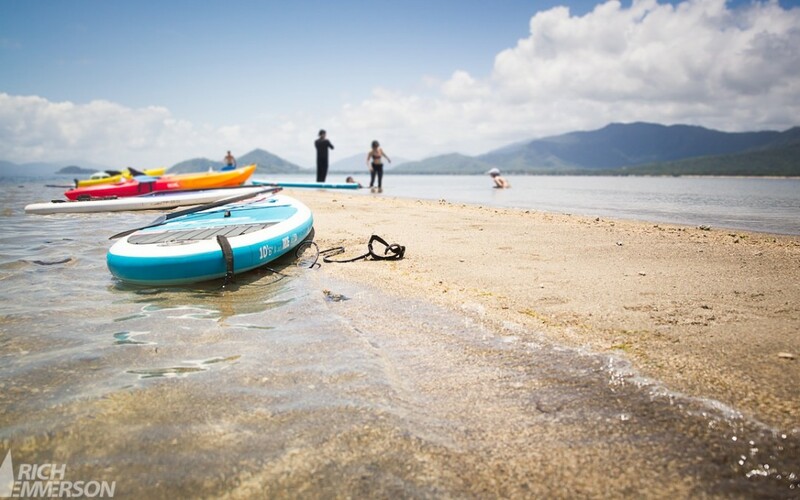 When it come to Cairns activities, stand up paddle boarding is definitely up there.Cairns is pretty much completely protected by the Great Barrier Reef, meaning we don’t get a lot of swell on our costal beaches. We do get a small wave from time to time though, which aren’t ideal for your standard surf board. The great thing about stand up paddle boards though is they can pretty much catch any wave. Not only are they good for catching waves, they are also amazing for cruising down our amazing rivers surrounded by rainforest. They are also a great way to explore the fringing reefs off Double Island, go snorkelling or adventure through the mangroves. The big advantage of Stand up paddle boarding over a coral reef, is you get such a great view, meaning spotting marine life and different corals is easy. It’s also great fun, good for fitness and the perfect way to make new friends. Kitesurfing has exploded all over Cairns the last few years. Whether you’re at Palm Cove, Yorkeys Knob or Machans Beach, you will see the beautiful colours of the kites everywhere. Here at Pacific Watersports we are you local Palm Cove kite school. We offer lessons, gear sales, gear hire and advise on everything kitesurfing. 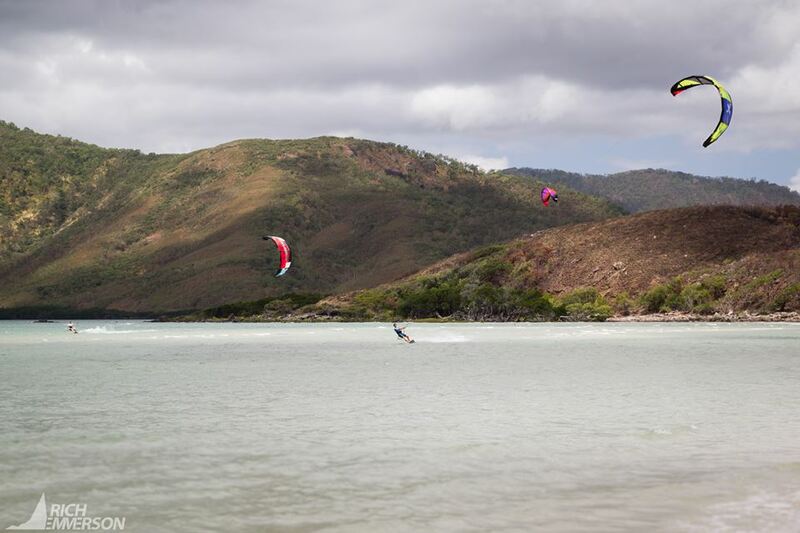 Kiteboarding Cairns operates at Yorkeys knob offering the same services. Cairns is world renowned for it’s kitesurfing. With perfect flat water lagoons all along the coast and a consistent long season, Cairns is the ultimate kitesurfing location. The Double Island Kayak Turtle Tour is a great activity for the whole family. Led by one of our experienced and knowledgable guides, Pacific Watersports will take you on an unforgettable morning around the breath taking Double Island. Leaving just after sunrise (7am) we cruise across to the coral reef which surrounds Double Island. Here we stop for a while and equipped with a snorkel and mask each, experience the majesty of the reef. The abundance of marine life around Double Island is phenomenal. You really have to see it to believe it. Turtles, rays, reef sharks and fish of all colours and sizes dwell here, and during our Double island Kayak Turtle Tour you get to spend time with them in their natural habitat. After our snorkel, we continue our Kayak adventure around to the other side of the Island, where we stop for a rest and a bite to eat and if the tides right, enter Double Island’s Cave. Out of all the Cairn’s activities, this is the one that you can’t afford to miss! Yep, that’s right. Yoga, whilst trying to balance on a Paddle board! Now this really is an activity you have to try when you are in Cairns! Pacific Watersports has teamed up with Hartig Yoga to bring Cairns this amazing new phenomenon. Practicing yoga on a paddle board brings a whole new dimension to your practice. Asanas (postures) that you are used to practicing on land become a whole lot harder! Sup Yoga requires more focus, more stabilisation and more core strength than yoga on the land, which makes for a good and fun work out for your body. But as well as increased strength and intensity, yoga on a paddle board offers deeper relaxation. Relaxing and surrendering into the practice becomes a whole lot easier when floating on a pool of water. Well I hope is blog is of some help to you during your stay in our beautiful city. If you would like to know more about the above activities, just give us a bell or shoot us an email and we’ll be more than happy to help. So you’ve rocked up to Cairns for a few days and wanna do cool stuff? Maybe you live here and wanna try a new experience? Whatever you situation, I have come up with 3 groovy things to do in Cairns that we have right here at Pacific Watersports. Im Looking for things to do in Cairns. What makes Pacific Watersports the right choice? 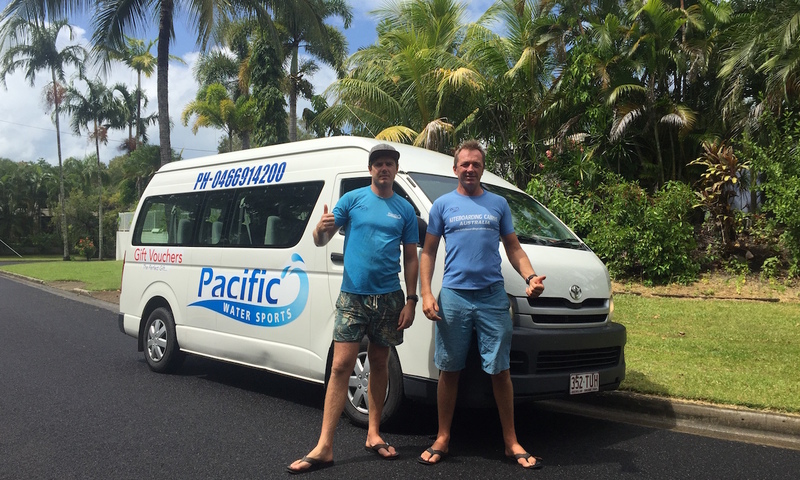 For a start off, all Pacific Water Sports tours are family run. Thats right, its a family operated business, so its got that real down to earth vie about it. Father – Andy and Son – Luke flow together to make sure everything thing is just down right awesome for people who try these things to do. Not only that, Luke’s Partner and all round lovely lady Beth adds to the mix to offer awesome Yoga and SUP Yoga classes. Secondly – Pacific Watersports has a great team of helpers. Mother and Son – Sunny and Keanu are just great. They have been with the team now for over 4 years and are fantastic. They are passionate about watersports and always there to help out. Of all the things to do in Cairns, the Kayak Turtle Tours are a real treat. The team sets off at 7am each morning and is shortly out on the the Double Island Coral Reef. This is officially the closest coral reef to the Cairns Northern Beaches. Once there, the exploring commences. Everyone has their eyes peeled for turtles and other marine life. 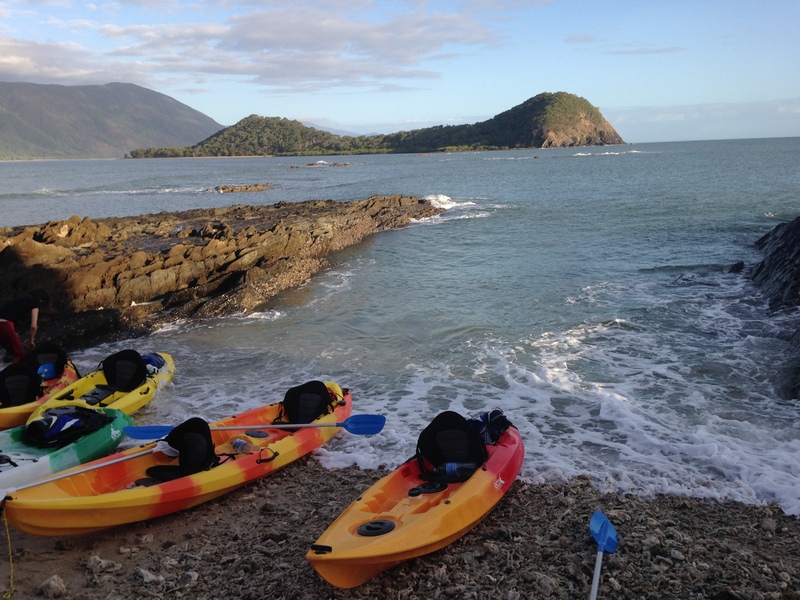 The tour also involves, exploring the island mangroves in the kayaks, entering the limestone cave with the kayaks (tide dependant) and chilling out on the secluded shoreline and enjoying delicious local tropical fruits. The Kayak Turtle Tour requires an average level of fitness. That said, people from all walks of life and from 8 years old right through to active senior people all get out there and love the experience. 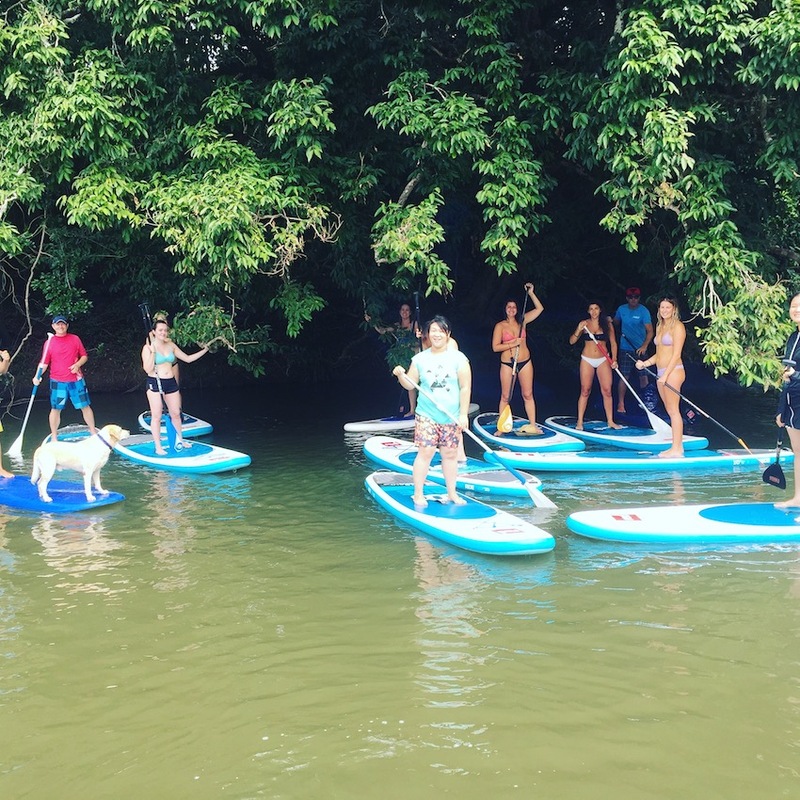 The Kuranda Rainforest Paddleboarding Adventure is a mega treat. Pacific Watersports pick everyone up and head up into the Upper Barron River in the lush Atherton Tablelands. This place is truly amazing. Surrounded by lush jungle and paddling through calm smooth waters. The experience is truly unique, and the team take you to places that are right off the grid. It cannot be denied, Kitesurfing is an exhilarating sport, perfect to suit any adrenaline junky. The team at Pacific Watersports have this sport dialed. Andy and Luke are professional instructors that get you out there experiencing the power of a kitesurfing kite right from the very first lesson. 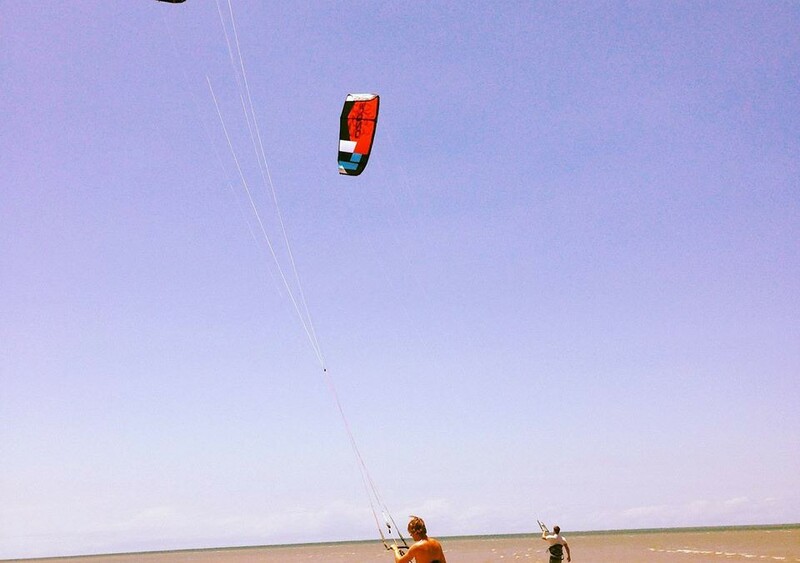 Kitesurfing is the perfect sport to learn when the strong trade winds kick in at Palm Cove through the cooler months. 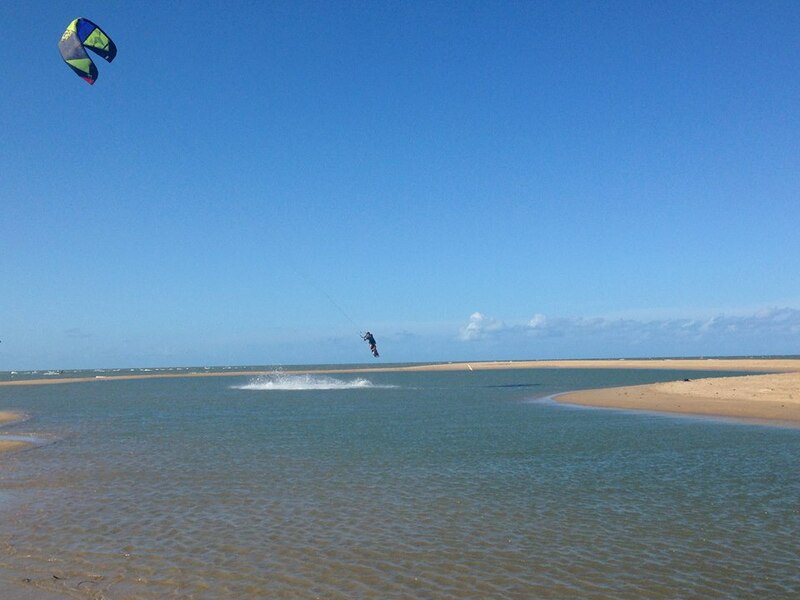 If you’re looking for kitesurfing lessons Cairns is ultimate location! Well guys and girls, guess what? The kitesurfing season has just kicked off! So there’s no better time to to learn the sport. Here at Pacific Watersports we are your professionals when it comes to kitesurfing lessons. 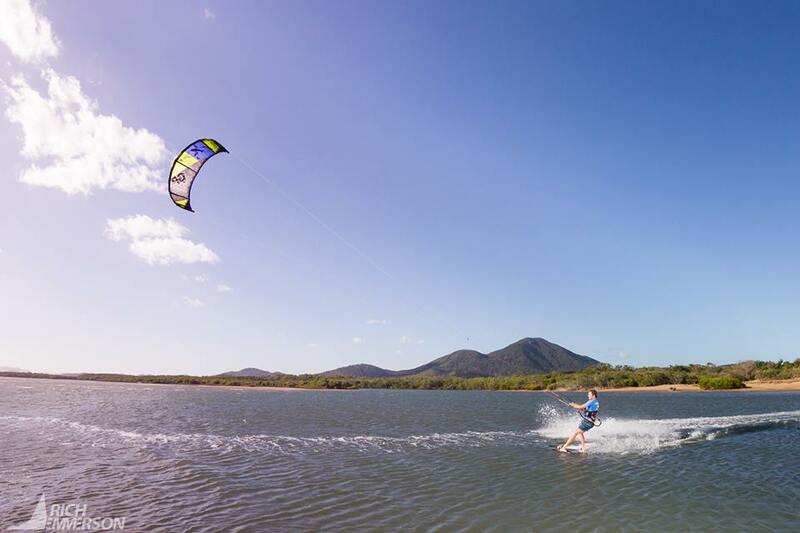 When it comes to kitesurfing lessons Cairns has a lot to offer. We have a great range of different conditions for learning. The wind consistency throughout the season is simply incredible. The flat-water reefs and flat-water sand bars at the river mouths make it a fun and safe place to learn. All of our kitesurfing instructors are IKO qualified and have years in the industry. Being avid kitesurfers ourselves, we are constantly trying to improve and develop our services. Well your best bet is to at least sign up to 1 lesson to get a feel for the sport. In saying that, most people do one lesson, end up super addicted to the sport and end up booking a second anyway. Often the course options will also offer some kind of discount too. 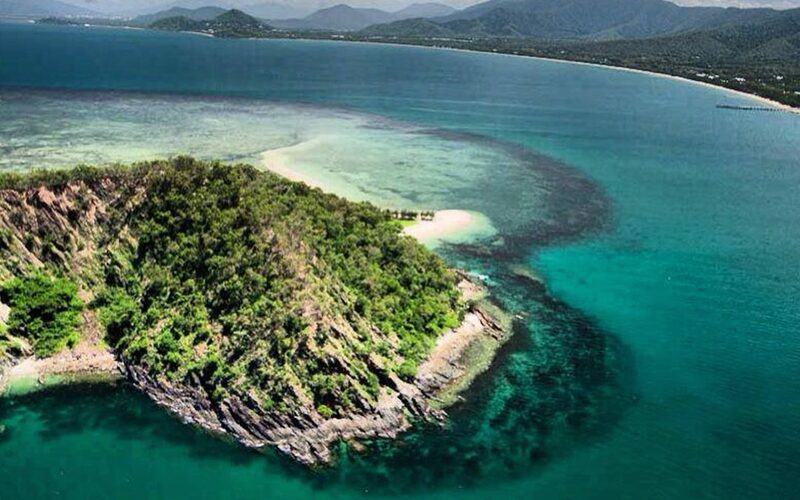 Palm Cove, Yorkeys Knob, Double Island and Machans Beach are all great locations in the area. Check out this blog for information on the different locations. Well you’ll never be short off things to do if by some chance there is no wind. We have the Great Barrier Reef at out front door and the oldest rainforest in the world at our backdoor. You can always hire a car from the friendly guys at Palm Cove Car Rentals and go explore the area that way. We have freshwater swimming holes and waterfalls littered everywhere, making it easy to find a nice chilled place to cool off. There’s definitely no shortage of accommodation in Cairns. There’s heaps of hotels and resorts to choose from at all the beaches. For resort style accommodation, check out these guy http://www.oasis-palmcove.com.au They are definitely a great option if there’s a a few of you, because you can stay in luxury for under $60 per person. Well thanks for taking the time to read my blog. If you have any further questions regarding Kitesurfing in Cairns of anything Cairns really, feel free to shoot us an email of give us a call. 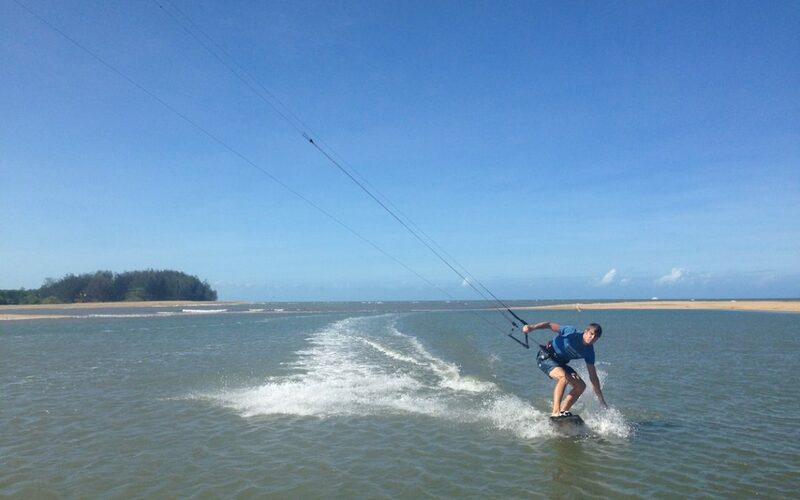 Here at Pacific Watersports we run kitesurfing lessons in Cairns. We have 2 great locations located on the northern beaches of Cairns. 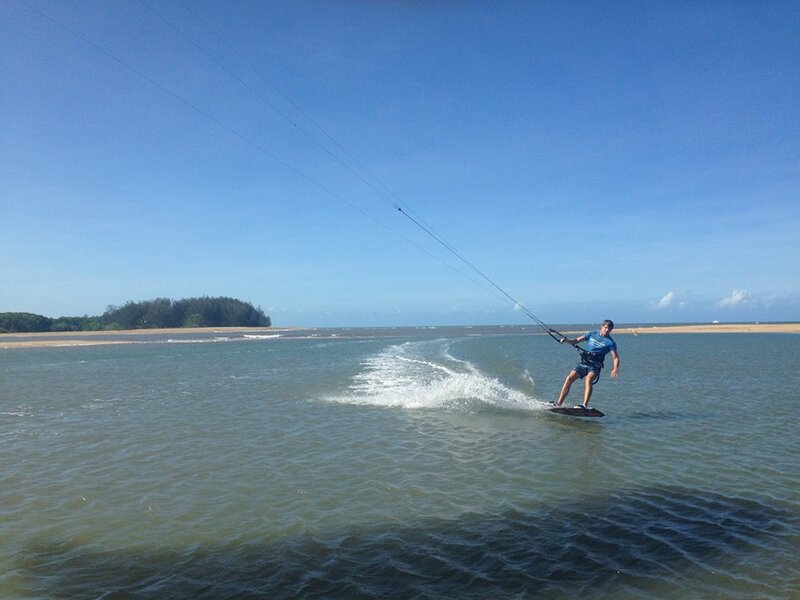 We run kitesurfing lessons at Palm Cove everyday. It’s a great place for learning to kitesurf, with a big clearing at the souh end of Williams Esplanade. We start our kitesurfing lesson on the beach, nailing all the basic skills before moving on to the water, where we go over body dragging. After body dragging we start introducing the board, by giving basic tasks, like carrying the board and flying the kite at the same time. Then it’s body dragging with the board before moving onto the basics of riding the board. We use all the latest equipment, upgrading our equipment regularly, insuring we are always using the latest safest equipment. We also use radio helmets so we can communicate with the student whilst out on the water. We also provide water and sun protection. The best way to get there is to head north of Cairns along the Captain Cook Highway. After about 30 minutes, you will see palm cove clearly sigh posted. Head down to the esplanade and find a car park. There are also public buses departing cairns regularly. Buses from Cairns cost about $5 and can take up to an hour. From March to November the wind blows from the south east, making the conditions very safe and predictable. On a higher tide the beach can be a bit narrow, so it pays to stay down the south end where the opening to the river mouth is. 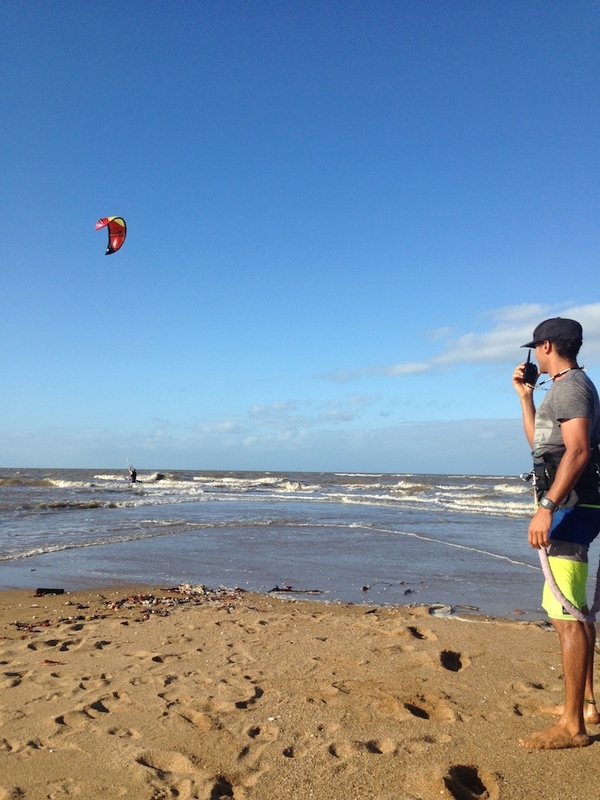 We also run kitesurfing lessons at Yorkeys Knob everyday. Yorekeys Knob is great for group lessons, as there is a big river mouth at the south end of the Beach, providing lagoons with knee deep water for hundreds of metres. We spend less time on the beach here than at Palm Cove, simply because there is more room for students. We start off with stabilising the kite and water relaunch, before moving on to kite diving and bodying dragging. Body dragging is very important, as it really makes the student comfortable in deeper water. After mastering body dragging, it then time to start introducing the board. Again head north from Cairns along the Captain Cook Highway. You will see the sign for the beach after about 15 minutes. When you get to the town, simply head down to Sims Esplanade. The kitesurfing rigging area is at the very south end of the Esplanade. 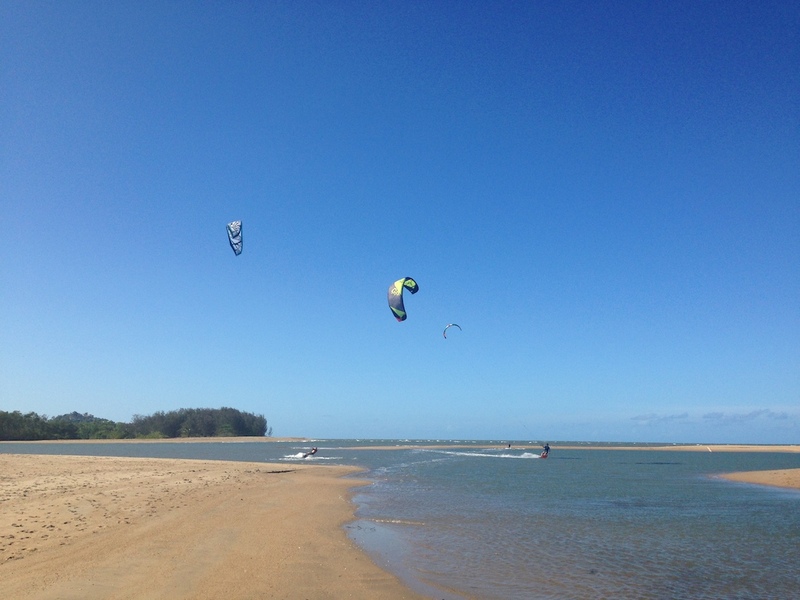 Yorkeys Knob has some of the best conditions in the world for kitesurfing and learning to kitesurf. The wind blows from the south east for about 9 month over the year, peaking mid winter (July). There’s is a river mouth there with big lagoons, making for amazing flat-water riding. If you ever have any question about kitesurfing at either of these amazing kitesurfing locations, feel free to call or email us anytime.